On Ferguson's Streets, Echoes Of Another Fatal Shooting Youth Radio's Myles Bess lived through the aftermath of the 2009 police shooting of an unarmed young black man, Oscar Grant, in Oakland, Calif. — and sees parallels in Ferguson, Mo., today. A memorial at the site where Michael Brown was shot, on Canfield Drive in Ferguson, Mo. Myles Bess, a reporter and producer with Youth Radio, has been reporting in Ferguson, Mo., where Michael Brown was shot by a police officer on Aug. 9. Bess lives in Oakland, Calif., and in 2009, he lived through the aftermath of the police shooting of another unarmed young black man, Oscar Grant. I was 14 years old when Oscar Grant was killed just a few miles from where I live. Grant was unarmed and lying facedown on the BART platform when a transit cop shot him in the back. Protesters in my town also demanded "No Justice, No Peace." But justice never really came for my community. The police officer who killed Grant was found guilty, but he spent only a year in jail. And real justice, like making sure something like that never happens again, seemed then, and now, like an impossibility. On the streets of Ferguson, Marvin Stokes is one of the few bright spots right now, and he's only 4 years old. I kneel all the way down to the ground to ask him if he knows where he's standing. "Do you know what happened?" I ask. "Yes. The police shot Mike Brown," Marvin says. 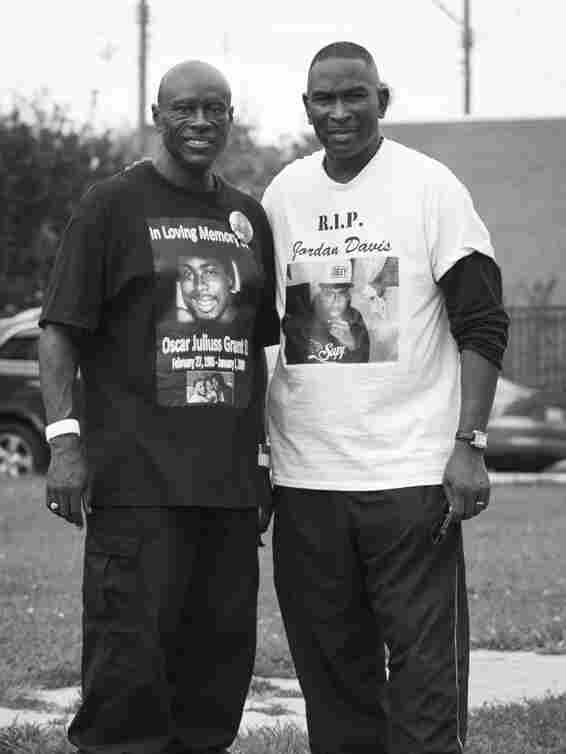 Cephus Johnson (left) is the uncle of Oscar Grant, who was killed in Oakland, Calif., in 2009. He stands in Ferguson with Ron Davis, whose son Jordan was 17 when he was shot and killed in Florida in 2012. 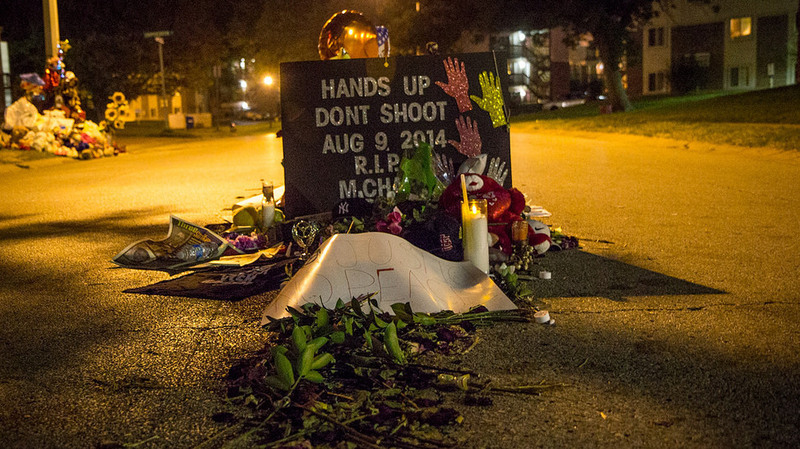 A little over two weeks ago, Michael Brown's body was lying a few feet away for hours on end. There's a huge graduation photo there now, propped up in the middle of the street. As cars approach, the smiling cap-and-gown picture gets brighter and brighter. And then, when the headlights pass, it goes dark. "I feel pain," Joelle Smith tells me at the makeshift memorial. Smith, who worked with at-risk kids for 14 years, is visiting Ferguson from Macon, Ga. "Eighteen years old, he's about to go to college — and isn't that what we teach our kids to do?" he says. "Three weeks ago, [Brown] had dreams. Now he's in the ground." Smith says he fully expects that more unarmed young black men will be shot by police. But others at the shooting site tell me they're hopeful change will come, and that they will be out there standing by until it does. I hop in the car to take one last spin through town, looking for protesters. As we drive down West Florissant Avenue, the only guy here is Don Lemon and others from CNN. No protesters. Hardly any police. It's literally crickets ... or maybe they're cicadas. At my last stop, I caught Missouri State Highway Patrol Capt. Ron Johnson's nightly press conference. After Johnson announced that tonight there was no tear gas, no smoke device, no mace, no arrests, nor bullets fired, a local reporter asks a less technical question. "Did you drive down West Florissant tonight?" the reporter asks. "Yes I did," says Johnson. What's "your feeling of seeing that, after everything else you've stood in the middle of for the last 15 days or so?" the reporter asks. "I tell you, it touched at the center of my emotions," Johnson says. "This is the Ferguson that I know. This is the Ferguson that I love, and it's good to see it back." The question on my mind is, "Back to what, exactly?"